Yesterday, several good friends and I were sitting in the office of a neurosurgeon. We listened to him as he explained why he left a thriving practice in a large metropolis to come to a much smaller hospital in our area of the country. He said it was all because of a letter he received. You see, he had been so busy with his job, he told us that he literally had not seen his little girl in three weeks. Then one night when he came home from work, there was a letter by his bed from his 11 year-old daughter. It was a letter in which this little girl told her daddy that she missed him and wanted more of his time. 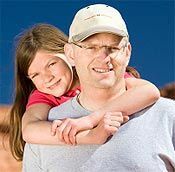 In the letter, this daughter acknowledged to her daddy that he had an important job, but she said, "Daddy, doing the 'right' thing is sometimes the 'hard' thing to do." It was at this point that this successful neurosurgeon decided he wanted to be a father first. So he left his practice and moved his family to South-Central Kentucky. I couldn't help but be touched by this doctor's story. Before me was a man who knew that there are things in life that are more important than fame, ego, work, and money. It doesn't take a "brain surgeon" be able to identify proper values and priorities in life. Sometimes, little 11 year-old girls who miss their daddy can discern those things. I couldn't help but be touched by this doctor's story. The question I have for you is have you discerned these same truths? "Sometimes the Hard Choice Is the Right Choice" by Steve Higginbotham is licensed under a Creative Commons License. Heartlight encourages you to share this material with others in church bulletins, personal emails, and other non-commercial uses. Please see our Usage Guidelines for more information.